I've been a Ford "Gearhead" for many, many years. On the truck side my first truck was a 1956 F100 pick up. After that I worked at Ford dealerships for 25+ years with too many demo's to remember. Now in my own business, auto/tk repair, I've had several Ranger shop trucks. Personally I've had four pickups in a row. All Fords. The first was 1996 Scab which was a great truck. Then a 2001 Screw, "King Ranch". That got me hooked on the Screw. Next a 2004 Screw, "King Ranch" and now a 2007 Screw, "Harley-Davidson". Have 3000 miles already on my 07. It's Dark Amythis and I like the color. My wife calls it "Purple", to bust my stones. In the sun this Amythis really glistens. I just added SS step bars which really add to the look of the truck and make it much easier to get in and out of. Also, added a Train Horn. Wow, will it blow you off the road...it is LOUD. Ford DOES make the best trucks out there. Ask me.....I fix all the makes and models. Fords are the best. Just picked up my ordered '07 F-150 Lariat, all options. I am really happy with the truck. This is a down sized truck for me from a '94 Ram 2500 Diesel. 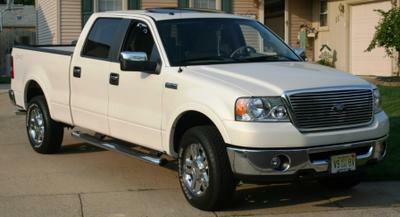 I was going to replace it with a new F-350 diesel, however, I have always wanted one of the F-150's so I bought one. I was a little nervous as to how this truck would handle pulling my boat being a half ton. It pulls just fine, much quicker than the Ram that is for sure. 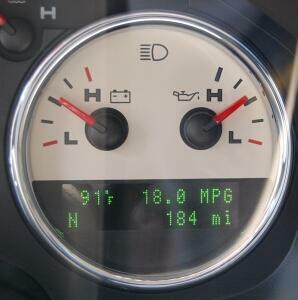 Gas mileage is something to be desired when pulling though (I don't pull slow). Around town and hwy driving I average 17+ no problem. Just have to keep the foot out of her and the mpg stays up. I am surprised with the power, and the ride is great. I did a lot of research, I knew I would buy a Ford anyway though. Very nice truck and highly recommended. Now it is time for the mods. wow, soooo many new 2007 owners. can we all sign in here please, seems the 2007 got many peoples attention. it was that or we needed a new vehicle, please tell us why u got the 2007.
and maybe a little bout what ya think bout it, now that ya got it. haha please tell the truth, cause i know i have a few disapointments. my mudflaps dont fit still tryin!! leather picks up color pigments when clothes wet from rain. seats are a little uncomfortable for very long cruises. see told ya its just a few,, overall i love this thing sooooo far. I just pick-up my 07 xlt 5.4, so far so good. look for a good exhaust and a cold air intake??? Picked mine up yesterday... wa-hoo, what a ride. First time truck owner, long time dreamer... someone pinch me! First mod, Line-X this week. Last edited by Grav Murk; 05-13-2007 at 10:52 PM. '07 SCREW Lariat in Dark Stone Metallic. I needed a bigger truck (previously had an '02 Dodge Dakota Club Cab with a highly modified 4.7L SOHC V8) that was less hot rod and more work oriented. With the incentives on this sucker, no other manufacturer was even close. I drove the new Tundra and the 6.0L GMC, but in the end the F150 was the most well rounded overall. Got my BRAND NEW SCREW two days ago! FX4, Dark Shadow Grey Metallic, 20", 5.5' Bed, Black Tubular Running Boards, Black Sport Cloth Interior, LOVE THIS TRUCK!! Count me in the club! Mine is still a work in progress, so pics to come! I got my '07 screw lariat 4x4 dark stone a couple of months ago. First thing that i did was got rid of that 30 pound muffler and put on a magna-flow exhaust and cold air intake. What a difference! I had a T.B.S. and immediatly got rid of that sucker. I should of done my homework on that. The only thing missing that i was wanting on this truck was the nav radio. Next install will be a edge-evo tuner, should make this thing where i want it. Lariat 4x4 Screw Black with gold two tone. I just got it about 3 weeks ago, but got the Line-x done, love it. Got the Jason Rage top ordered and should have it on by Friday. Getting use to the Ford idiosynchrises, had a Chevy and GMC for a long time. Guess old habits are hard to break. Sirius! I never had my XM drop out driving around town, but it happens like clockwork in certain areas around here. Other than that, it's been great. Well, I've had my 2007 SCREW 5.4 3v, Tow Package, LS, 3.73 ratio, Dark Blue Pearl, Flex Fluel, XLT now since Febuary. I have 4136mi on it. I have to say that I Love this vehicle, I've towed several 5000LB loads so far, stable strong vehicle. I don't find it bad in gas if driven with a light foot. Done appearance mods, Billet Grille, Chrome Mini Bug Shield, Sirius Sat radio, Chrome handles, Bedliner, Molded Splashguards, Tonneau. No Warrantee work done so far! One Solid Vehicle, Love the quiet cabin & ride!!! Got it 3 weeks ago, like it so far. I agree in the in cab storage could be better, but not a real big deal. No new mods yet, looking to do a bedrug and cover (leaning towards the Extang Tri-fecta) but am open to comments/suggestions. $$$ is tight so it will be alittle slow but I plan to have it for a while so I have plenty of time!!! Picked mine up a month ago and didnt look back. Glad I found this forum, I have spent hours reading and reading and reading. Now I cant wait till I can start the modifications. Just posted pic's today in the gallery. I've wanted a 04-07 F150 FX4 since i first saw this new body and am very happy with it. It is fully loaded and i'm currently saving for a 8" RIZE lift with 20's and 37's !